Dadra and Nagar Haveli is a Union Territory in Western India. Nagar Haveli is wedged between Maharashtra and Gujarat, whereas Dadra is a enclave 1 km NW surrounded by Gujarat. 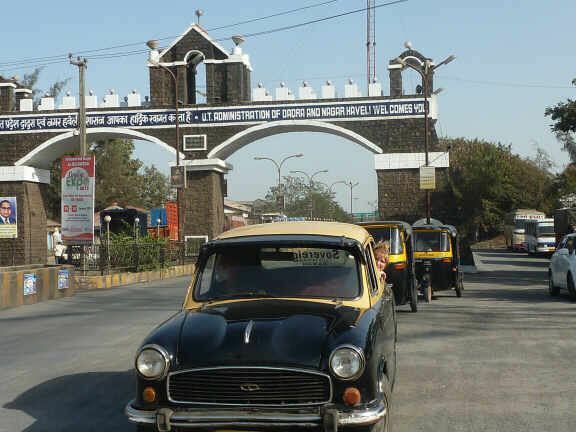 The shared capital is Silvassa. The larger part spans a large, roughly c-shaped area 12–30 kilometres up-river from the city of Daman on the coast, at the centre of which, and thus outside the territory, is the Madhuban reservoir. Dadra and Nagar Haveli (DNH) are in the middle of the undulating watershed of the Daman Ganga River, which (after the reservoir) flows through Nagar Haveli and later forms the short southern border of Dadra. The towns of Dadra and Silvassa lie on the north bank of the river. The Western Ghats range rises to the east, and the foothills of the range occupy the eastern portion of the district. While the territory is landlocked, the Arabian Sea lies just to the west in Gujarat. The profound history of Dadra and Nagar Haveli begins with the defeat of the Kohli chieftains of the region by the invading Rajput kings. It was the Marathas that retrieved the region from the rule of the Rajputs in the mid 18th century. In 1779, the Maratha Peshwa formed an alliance with the Portuguese allowing them to collect revenue from the 79 villages of Dadra and Nagar Haveli. The rule of the Portuguese in the region continued till the region gained independence on 2 August 1954. The region was merged with the Union of India in the year 1961. These territories were earlier ruled by the Koli chiefs who were defeated by the Hindu kings of Jawhar and Ramnagar. The Marathas had conquered and annexed these territories to their kingdom. To keep the British at bay and to enlist their support against the Moghuls, the Marathas, who had founded their own empire/kingdom made friends with the Portuguese and signed with them a treaty in 1779. Under this, the Maratha-Peshwa agreed that the Portuguese would be allowed to collect revenues from Dadra and Nagar Haveli which consisted of 72 villages (then known as parganas, now referred to as district places). In return for security against the two large empires, the main extent of the treatys concessions to the Portuguese were that they would only collect revenue in compensation for their loss of a warship, Santana, which had earlier been captured by the Marathas but not surrendered to the Portuguese in spite of their many entreaties. It was annexed by India from Portugal on 2 August 1954. The people of the territory established free administration of Dadra and Nagar Haveli, which was finally merged into the Union of India in 1961. Silvassa is the capital of Dadra and Nagar Haveli, a Union Territory of India. Tourists coming from abroad may not know the political administration of India. The Union of India is divided into 29 States (including the newly formed Telengana State) and 7 Union Territories. The States are administered by the State Governments elected by the electorate of each State. But the Union Territories are administered directly by the Central (Federal) Government, although Pondicherry (Puducherry) and the Capital Territory of Delhi have semi-independent elected governments. Dadra and Nagar Haveli (or D.N.H or D. & N. H.) was formerly a Portuguese colony until it was liberated in 1954. But the Territory remained independent until 1961 when it was integrated into the Union of India. It is located between the States of Maharashtra (in the south) and Gujarat (in the north). The nearest railway station is Vapi, located in Gujarat and 18 km from Silvassa. Vapi is located on the Mumbai-Delhi route. Mumbai (formerly known as Bombay, the capital of Maharashtra) is 180 km south of Silvassa. The city of Surat located in Gujarat is 140 km away to north. Delhi is approximately 1600 km away to north as well. Since D.N.H. has many industries, people from all over the country have migrated to the region and the population is approximately 4,00,000. The territory has an area of approximately 491 sq km. Silvassa town is around 15 sq km as of 21.05.2014, the date this article was authored. There are 72 villages, mainly inhabited by the various tribal communities like the Varly (Varlie), Kokana, Dhodia, Koli, Kathodi, Naika, Dubla and Kolgha. The tribal communities are locally known as adivasi (which means original inhabitant). Each community has its own culture, traditions and languages and dialects. None of these languages has written literature or script until today. The tribal communities consist of approximately 60% of the population of D.N.H. (Earlier in the eighties it was more than 80%, but after influx from different parts of the country, the percentage has reduced). But the influx has helped the tribals in increasing their earnings. In the year 1262 a Rajput prince from Rajasthan (now Rajasthan is a State in India, located to the north of Gujarat State), named Ramsinh established himself as the ruler of Ramnagar, the present day Dharampur, which consisted of 8 Paraganas (group of villages) and assumed the title Maharana. Nagar Haveli was one of the Paraganas. Time passed on. In the year 1360 Rana Dharamshah I (the first) shifted his capital from Nagar Haveli to Nagar Fatehpur. Vasco da Gama (a Portuguese explorer) with his fleet landed in May 1498, at Kaappaakkadav (present day Kappad, pronounced as Kaappaad) about 15 to 16 kilometres north of Calicut (in the Malayalam language Calicut is Kozhikkode). Subsequently in the next few centuries the Portuguese cpatured many places along the western coast as well as the eastern coast and built factories and forts and established trading centres, entering into treaties or defeating the local rulers. With the rise of the Maratha power, Shivaji viewed Ramnagar as an important locality. He captured the region, but Somshah Rana recaptured it in 1690. After the Treaty of Vasai (which was on 6 May 1739) Vasai and the surrounding territories came under the Maratha rule. Soon after, the Marathas captured Ramnagar but reinstated the ruler, Ramdeo, under conditions. Thus the Marathas acquired the rights to collect revenue, known as chauthai from Nagar Haveli and two other paraganas. During the time of Dharamdeo, the son of Ramdeo, due to his ungrateful attitude, (he neglected the conditions imposed earlier) the Marathas captured Nagar Haveli and the surrounding regions. In 1772, the Marathas captured a Portuguese warship named Santana. At the same time the Marathas had to struggle with the British. They always feared that the Portuguese would join hands with the British against them. The Mughals were already a constant threat. An alliance between the British and the Portuguese was a nightmare for the Marathas. Due to this, in 1779, the Marathas signed a treaty with the Portuguese by which, as a compensation for the loss of the warship Santana, the Marathas allowed the Portuguese to collect revenue from 72 villages of Dadra and Nagar Haveli. In 1818, the Maratha Empire collapsed. Thus the Portuguese ultimately became the rulers of Dadra and Nagar Haveli. But as Daman was more important from the point of view of generation of income from exports, D.N.H. received very little attention from the Portuguese except for exploitation of the rich forest wealth of the region. As time passed the Indian Independence Struggle picked up momentum. On 18 June 1946, Dr. Ram Manohar Lohia was arrested in Goa. This was the beginning of the freedom struggle in Goa. He was deported to India. On 15 August 1947, India became independent from the British rule, but the Portuguese and other European colonies continued to be so. Shri Karmalkar reached Vapi and met Shri. Jayantibhai Desai from Dadra. He also met Shri Bhikubhai Pandya from Nani Daman and Shri Vanmali Bhavsar from Silvassa. Azad Gomantak Dal under the leadership of Shri Vishwanath Lavande, Shri Dattatreya Deshpande, Shri Prabhakar Sinar and others, the Rashtriya Swaymsewak Sangh under the leadership of Shri Raja Wakankar, Communist Party under the leadership of Mr Shamrao Parulekar and Smt Godavaribai Parulekar, and the United Front of Goans under the leadership of Francis Mascerenhas, J.M. D’Souza, Waman Desai and others were also attempting the liberation of D.N.H. On 18 June 1954, many leaders met at Lavaccha. Lavaccha and Vapi were Indian territories. The order in which these places are lying is, N.H., Lavaccha, Dadra, Vapi and Daman. So the Portuguese officers required transit permit through Indian territories of Lavaccha and Vapi to reach N.H. Dadra and Daman. On the night of 28 July, around 30 to 35 volunteers of R.S.S. and Azad Gomantak Dal proceeded to Naroli from Karambele by swimming across the rivulets. June to September is the rainy season in the region and the rivers are usually flooded during this season. The Daman Ganga river was flooded and no help could reach Naroli. There were only six police personnel. The volunteers and the villagers reached the police station and asked them to surrender or face death. They immediately surrendered. The Portuguese rule of Naroli came to an end. The Special Reserve Police in the Indian Territory did not intervene in any way. Mr J.D. Nagarwala, the D.I.G. of the Special Reserve Police in the Indian Territory, without entering D.N.H. asked Captain Fidalgo, the administrator of Dadra and Nagar Haveli to surrender to the Indian Forces along with his paramilitary forces before they would be butchered by the liberators. Leaving about 50 policemen and five civilian officers posted at Silvassa, Captain Fidalgo fled to Udva passing through Rakholi, Dappada and Khanvel and surrendered to the SRP on 11 August. They were later allowed to go to Goa. In the meanwhile there were several rumours and the officers at Silvassa were in confusion. On 1 August the liberators took advantage of the situation and proceeded from Dadra and Naroli and liberated Pipariya. The five police officers surrendered without resistance. During the night the volunteers divided themselves into three batches and reached the police chowky at Silvassa. The police Chowky at Silvassa was protected by sand bags. There were three policemen guarding from three sides. Shri Vasant Badve, Shri Vishnu Bhople and Shri Shantaram Vaidya overpowered them from behind when least expected. The other policemen surrendered without resistance on seeing the other volunteers. The volunteers spent the night awake at the police chowky. In the morning of 2 August 1954, the liberators reached the town of Silvassa to find it free of any Portuguese occupation. The liberation of Dadra and Nagar Haveli was complete. Senhor Luis de Gama, the eldest nationalist hoisted the Indian national flag and declared the territory of Dadra and Nagar Haveli liberated and the National Anthem was sung. Note: I had put up a tableau regarding the History of D.N.H. in 2004 when I was working in Lions School. I still have the copy of its recording. Mr. Lele had written a history of D.N.H. I have met many elderly persons of the Territory and confirmed all the facts presented above. The area of Dadra and Nagar Haveli is spread over 491 km2, landlocked between Gujarat to the north and Maharashtra to the south. The Union Territory comprises two separate geographical units – Dadra and Nagar Haveli. It is close to on the Western coast of India between the parallels of 20º – 0’ and 20º – 25’ of latitude North and between the meridian 72º – 50’ and 73º – 15’ of longitude East. It occupies an area of 491 square kilometres (190 sq mi), comparatively equivalent to the Philippines Biliran Island. It ranks 4th among the Union Territories and 32nd including the states. The territory is surrounded by Valsad District of Gujarat on the West, North and East and by Thane District of Maharashtra on the South and South-East (after division of Thane district, it is now surrounded by newly formed Palghar District.). Dadra and Nagar Havelis gross state domestic product for 2004 is estimated at $218 million in current prices. Its nominal GDP increased to $360 million in the year 2009 with a per capita GDP of $1,050. The economy of DNH relies on five major activities viz. Agriculture, Industries, Forestry, Animal Husbandry and Tourism.